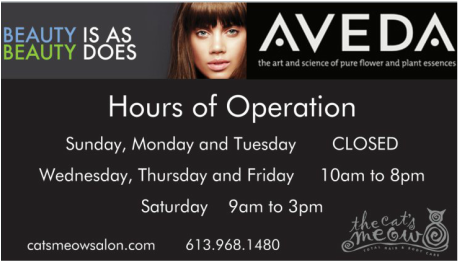 At The Cat's Meow Spa our signature massages, with the AVEDA aroma of your choice, are all about relaxation. Your spa therapist will combine calming massage strokes, effleurage, and compressions. Massage restores balance and reduces tensions while creating a sense of relaxation and well-being. All of our massage treatments utilize the power of Aveda's signature aromas. Your choice of Stress Fix, Rosemary Mint, Shampure or Beautifying Compositions is incorporated into the massage reduce feelings of anxiety and strain. When these aromas are partnered with Swedish Massage, which calms and soothes, and Deep Tissue Massage which targets highly stressed areas; your tension will slowly melt away and your muscles will relax and recover. A natural blend of hot stones and traditional massage techniques are integrated in this full body massage, to relieve tension and stress. This deeply relaxing treatment is enhanced by the use of warm basalt stones combined with essential oils to loosen, stretch and relax tired muscles. Your esthetician will customize each treatment to suit individual needs.Hot stone massage must be requested at time of booking to allow time for the stones to warm. Give special attention to yourself and your baby before that precious person arrives. This gentle treatment stimulates circulation, improves elasticity and eases hip, leg and lower back pain. It helps to reduce water retention and swelling in the hands and feet. We use pillows and requested pressure to ensure your comfort throughout the massage. This massage makes an excellent gift for expectant mothers! *Please note: Guest must have completed their first trimester in order to experience this service and should always consult with their doctor prior to receiving any massage. Why not try a Couples Massage? The same amazing experience of The Cat's Meow signature massages, times two! Select any two massages and you can enjoy this pleasure with a good friend, or your special someone in our private massage room, side-by-side. Two therapists and two tables are used during this service. Alleviates low-back pain and improve range of motion. Enhances immunity by stimulating lymph flow - the body's natural defence system. Helps athletes of any level prepare for, and recover from, strenuous workouts. Improves the condition of the body's largest organ -the skin. Exercises and stretches weak, tight or atrophied muscles. Reduces post-surgery adhesions and swelling. Pumps oxygen and nutrients into tissues and vital organs, improving circulation. Relaxes and softens injured, tired and overused muscles. Releases endorphins - amino acids that work as the body's natural pain killer. It leaves you feeling relaxed and refreshed.